The John Deere p/n is M21TR. The INNER diameter of this ring gear is 12 1/4 inches with 105 teeth. The picture is FILE picture only, they all look alike so I use one picture for all of my ring gear auctions and they only use one ring gear as described in description to fit the application as described in description. I have hundreds of different seats or anything you need for your tractor or Kohler K series engine. 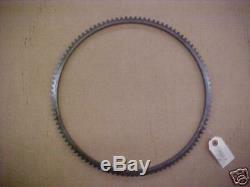 The item "John Deere flywheel ring gear M 40 320 420 430 435 440" is in sale since Tuesday, July 23, 2013. This item is in the category "Business & Industrial\Heavy Equipment, Parts & Attachments\Heavy Equipment Parts & Accessories\Antique & Vintage Equipment Parts". The seller is "bakt4kids" and is located in Wauseon, Ohio. This item can be shipped worldwide.